The difference is that we’re not aliens visiting another planet, and in Mad Men, as well as in real life here on Earth, our trash is just junk. There is no black market scooping up left over candy wrappers and plastic containers. Okay, there are recycling facilities, and more and more cities across the U.S. are banning single-use plastic bags and straws. But the ever-increasing Pacific Garbage Patch shows us that we could all stand to step up our efforts to cut back on plastic use (especially when you also consider the dangers of plastic to our health, as well as the environment!). in my bag at all times, skip the straws, use glass storage containers, try to swap packaged foods for those I can get in the bulk bins at my grocery store. I also have a subscription to Imperfect Produce, which delivers a box full of ‘imperfect’ but still fresh and delicious produce that would normally go straight to the landfill (love Imperfect Produce!!). Aside from the cardboard box, there is minimal other packaging in my weekly delivery. The downside is that unwrapped produce in the fridge can go wilty pretty quick. So I needed something to wrap the items that wouldn’t fit or weren’t suitable for glass storage containers. But why not repurpose some old fabric and make my own? And a quick google search lead me to DIY Natural’s handy tutorial. I’ll let you click on over there to get the full instructions, but here’s the basic supplies list*, as well as some tips that will make your job so much easier! • Be sure your fabric has been washed and dried thoroughly. Also, vintage fabric, regardless of the amount of times it has been washed, may bleed when the beeswax is applied. Something about the beeswax causes instability in some vintage dies, especially reds, so you may want to do a quick swatch with the wax before working on a complete wrap. • Use parchment paper. I originally tried using teflon sheets, thinking it would save paper, but the teflon whisked the melted wax all over the place and it was a big mess. The parchment paper absorbs just enough wax to keep it malleable so you can push it where you want it to go, without it slipping and dripping all over the place. Also, the paper works better and faster as it becomes coated in wax, so you can keep reusing the same two sheets throughout the project. • Start your beeswax in the middle of your fabric and then work out to the edges. I eventually discovered that starting with a small pile in the center gave a little pool of wax that was easy to smooth to the desired areas. • Make sure your wrap is evenly coated in beeswax. You want it to be fairly saturated. As the wax dissipates over time, you can always add more wax to extend the life of the wrap. • Be sure your wraps are thoroughly dry before use. I hung them outside to dry, but also because they looked darn cute hanging on the line. •When wrapping food, press and hold the wrap over food/containers for a moment to use your body heat to adhere the wax into shape. It works well and looks pretty too! If you try these Reusable Food Wraps and use any of my tips, I’d love to hear what you think!! Please leave a comment below or instagram with the hashtag #makeadlib . 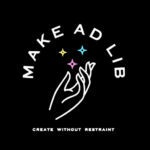 Don’t forget to tag @makeadlib so I can see your beautiful creation!